Home Cryptocurrency Enron stock and Bitcoin: Which one is the bubble? Enron stock and Bitcoin: Which one is the bubble? Since Saudi Arabia’s Prince Alwaleed bin Talalsaid said Bitcoin was “the new Enron”, I intended to make a story to compare both. From my perspective, they are completely different. But we should try to be as objective as possible when looking at the facts in this analysis. Enron is a Nebraska pipe company founded in 1985, after merging Houstion Natural Gas and InterNorth. During the merger, Enron fell into debt and needed a new business. CEO Ken Lay came up with a new idea for a Gas Bank, which was set up in 1990 with the help of Jeff Skilling. This new business focuses on creating the Energy Market and has succeeded in making Enron profitable again. Until 1998, business and securities were made in the normal range, and then there was a large increase in stock value. The creation of Enron Online (EOL) in October 1999 and the signing of a Video-to-Demand agreement with Blockbuster in July 2000 made the stock soar. Although these businesses do not generate any revenue, the stock market has rewarded stock prices because they see the future potential in Enron’s new internet market. The company reached the highest level of all time at $ 90.56 in August 2000. An energy company, which is listed on the NYSE, lied about their profits during the dot-com race and tricked most people on Wall Street. Bitcoin is a decentralized pre-coding system created in 2008 by a mysterious contributor with a pseudonym “Satoshi Nakamoto”. Bitcoin is known as “Gold 2.0”, its innovation lies in verifiable scarcity; Smart algorithms ensure that there will never be more than 21 million coins, or the entire system will be worthless due to the lack of trust. Bitcoin and its price remain at a relative minimum, going from worthless to $ 0.01 in 2010. The opening source project grows rapidly, with a developer community working without compensation and mining centers appearing around the world, especially in China, where energy costs are low. In 2017, the pre-coding market began a massive bull-run, new coins have formed daily thanks to a new platform and cryptography called Ethereum. In this rally, the Bitcoin developers have a disagreement about how to develop the project and the coin split into two. Regulations on crypto currency and a complete ban in some countries also made it difficult to expand Bitcoin. The highest price of all time was at $ 19,783 in December 2017. If you look at the worksheet above, you will see that this is only one of 12 previous drops, and it ranks 4th in severity. A new form of currency is created and owned by nobody. 10 years later, the development community and 3rd party support are stronger than ever. The price is still extremely volatile. Enron collapsed. Bitcoin is not yet. Enron is a company. Bitcoin is a type of technology. Enron increased and decreased one time in price. 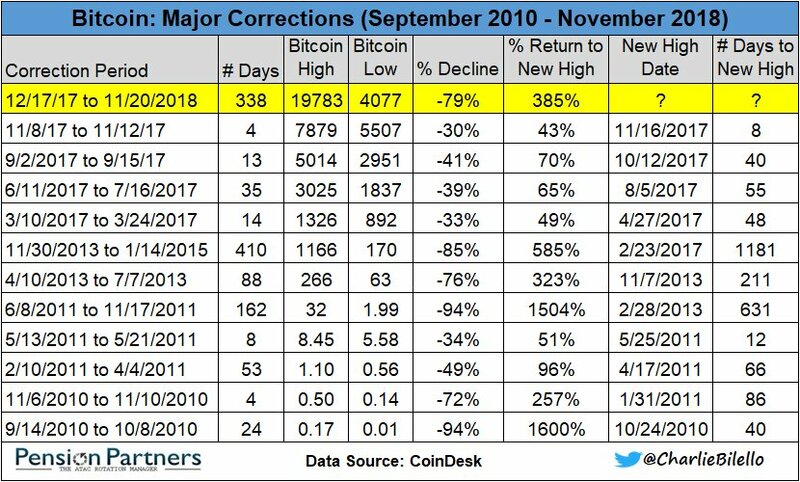 Bitcoin has 12 times. Enron “lied” while working under the specified framework. Bitcoin is completely open source, transparent and can fit into any legal framework that we choose to include. Enron is controlled by everyone. Bitcoin is not controlled by anyone. The main difference is in motivation. Enron is controlled by people, who let greed control their decision making and ultimately deceive investors for up to $ 74 billion. In Bitcoin, no one is profitable. If we want to make people believe that there is a person plotting behind this, will they sell everything on top like Enron’s insiders? Previous articleWhether the second Trump-Kim summit will take place in Da Nang?